At some point a few years back, the notion of a hidden, shadow menu—imminently better and more inventive than the normal menu—became a necessity at all chain restaurants. Secret menus are sort of like the fan theories that connect various fictional universes: They reassemble the known into a new order that may not necessarily be better but is, well, at least new. Taco Bell even stole one of Chipotle’s secret-menu items, the Quesarito, which turned a quesadilla into the shell for a burrito and put it on its own menu. It tastes pretty good! However, at some point, all secret menu items were uncovered, and so now humans must forge new assemblages of fast food items that we might secretly order to impress friends. The typically exuberant men of Good Mythical Morning set out to do just that, and their results are… entertaining, if not appetizing. 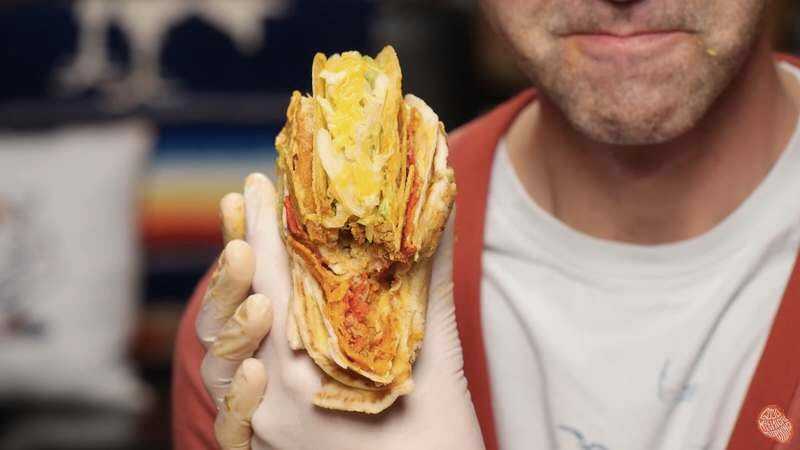 Their first item involves two Crunch Wrap Supremes stacked together along with the squeezed out innards of a Burrito Supreme to create something they call the Mexican Pizza Supreme. There is a lot of squeezing out of innards in the video as well as a lot of squeezing together of those innards to create new goos that are then placed between things. Taco Bell’s ongoing lack of tamales is addressed by creating a potato-filled goo, which is then assembled into patties, placed inside of a taco wrapper, and twisted into a completely unconvincing facsimile of a tamale shape. Finally comes the Cheesy Octodecker Taco, which combines every type of taco from the chain into one elaborate monstrosity that should never be eaten by anyone. Taco Bell’s foods are uniquely well-suited to this treatment, given the restaurant’s penchant for reassembling ingredients into new forms and the fact that, give or take an ingredient, they’re all sort of the same. These proposed secret menu items test the human body’s willingness to consume all of those ingredients at once and in a decidedly avant-garde, conceptual form. The final frontier of fast food secret menus is here, and it is extremely gooey.